Dispenser: This block can hold as many as nine stacks of items. When powered, it launches a random item from its inventory in some direction (depending on which way the dispenser is facing). This has some interesting possibilities: The dispenser can shoot arrows and fire charges, use buckets of water and lava, apply bone meal, throw snowballs and splash potions, place and ignite TNT, hatch monster eggs, and cause fire with flint and steel. If the dispenser uses any other item, it throws away the item by a few blocks. Dropper: This block is similar to the dispenser except that it doesn’t attempt to use the items it contains — it simply spits one out every time it’s powered. In other words, if you don’t want any of the dispenser’s fancier functions (shooting arrows or using buckets of water, for example), just use a dropper instead. The dropper also has another useful property: If a dropper is facing and directly adjacent to another container, it places an item into the container when powered (whereas the dispenser just drops the item on top of the container). Note block: This block plays a musical note when powered. The instrument depends on the texture of the block directly below it — for example, wooden blocks produce a bass sound, and stony blocks produce drum sounds. You can right-click the block to change its pitch. Piston: When powered, this block extends outward into an adjacent space, pushing any blocks in its way. A piston can push as many as 12 blocks, with a few exceptions (such as obsidian and containers). Consider also the sticky piston variant: When it loses power and retracts, it pulls back the block in front of the piston’s extension. Pistons also have some strange properties regarding how they can be powered. For example, a piston facing upward cannot be powered from above — however, when extended, its arm can be powered. Another strange feature is that the piston can activate when the block above it is powered, but only after an adjacent block is updated (destroyed, added, or modified). Door and trapdoor: Gateways such as doors, trapdoors, and fence gates open when powered and close when unpowered. Though all these items can be made of wood, and can also be opened manually by the player, doors and trapdoors have an iron variant that can be opened only with redstone power. Redstone lamp: The redstone lamp turns on when powered, providing light within a wide radius. 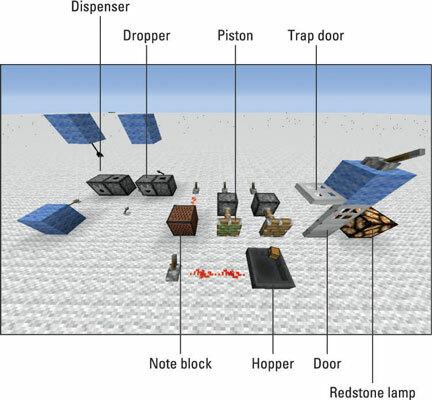 Hopper: The hopper is an interesting automatic device, taking all items directly above it and depositing them to other containers. However, this function can be halted by powering the hopper with redstone: While powered, it doesn’t receive or output any items.